The type of signs that a business chooses can say a lot about it including how it operates and what kind of culture it has. If not chosen wisely, then the quality of the signs that end up on walls, desks, doors, and other locations throughout the building can end up looking second rate and unprofessional. This can leave a rather nasty impression on your visitors! Engrave Awards & More brings class and subtlelty to the table with its unique range of office name plates, office signboards, conference signage, corporate signage and entrance signages! Available in a variety of materials, shapes and sizes, they can be customised to suit your requirements! 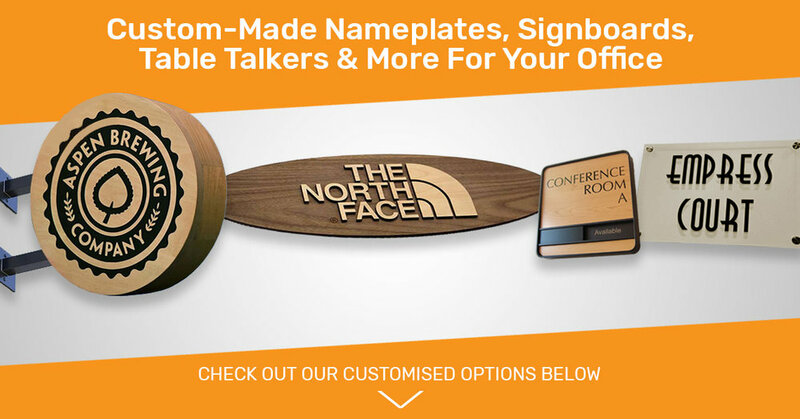 Engrave offers you India's largest collection of office desk name plates online. Add a personal touch to your workspace with personalised desk name plate designs for office that reflects your name and title. Choose the perfect customised desk name plate that best represents your position and personality from our extensive range desk name plate designs for offices. This sturdy desk wedge is made of solid import-grade wood with a pure brass sheet that is etched-paint filled-laminated and pasted directly onto the wood. The nature of the wood creates a nice contrast with the brass plate. This premier desk wedge also has a business card holder that holds the standard 3-1/2" long business cards - thus combining functionality with recognition. The name plates are made using high quality cast acrylic as raw material and top quality colour prints as inserts. The inserts are replaceable and come in different templates. Our Excelus range of office desk name plates is the true mark of the business professional. Each personalised desk sign is made from ecologically harvested teak wood. Make a personalised acrylic desk block for your office executives and employees. Made with the best quality acrylic and with chamfered corners, this nameplate is the perfect desk accessory to give your business a professional feel and a customized touch. For the love of names, carving your name into Siporex blocks is an artistic way to showcase the popular art of naming. Siporex is a light weight concrete block and name plates carved out of the material can be quite an eye-turner. It comes a stylish stand that allows it to sit prettily on the desks of your conference room or cabin. Break away from the monotony of your office decor with this unconventional Office Desk Name Plate crafted to create an impression. Crafted in MDF, this name plate is ideal for desks. Letters are cut out in wood. Names can easily be replaced with the slide out feature. Handcrafted designer desk nameplates is designed on the basis of the USPs of the product-calligraphy, design, handmade. It's about the celebration of individuals making it more personalized. Apart from the designs offered to you we can customize as per your requirements. We can also create only letters with some great different finishes. Chemically etched and brushed stainless steel v-shape Table top with polyurethane paint. Matter will be etched on both side. Class up your desk at work with these fully customizable glass office desk signs with colored vinyl. These are the perfect contemporary desk signs for employees and executives! A great conference room sign displays the name of your room and can even display the availability of your conference room using sliding availability tabs. The proper sign design can add a level of professionalism to any office or workplace. Create your own custom office door signs - our in use/in session conference room signs can be personalized with the text or layout of your choice - your room name or personnel title is customizable and so is the slider "in/out" and "In Session" areas. Easily display the availability of any employee, meeting area, room or office. Custom text and logos at no additional charge. Our rectangular stainless steel plates with a attractive and strong Arial font and an silver black color combination to highlight the instructions that you wish to dictate. Sliding signs are perfect for 'Meeting In Progress' signs or any custom text you need to display. Add a professional look to any doctor's office, meeting room, conference room, board room or office environment, with these slider signs framed in black architectural metal with brushed metal nameplates! A contemporary and elegant option with a rich black metal frame enhanced by black laser engraved lettering on a premium wood tone sign plate - ideal for room signs, conference rooms & meeting rooms. We specialize in brushed metal office signs and personalized signs for office doors, cubicles and office walls. Choose from a variety of brushed metal door signs in a variety of colors and name plate sizes - with free customizable text and graphics. Room signs, door signs and name tags for office doors to fit your business or office environment. Mark your offices, restrooms and lobby walls with office signage that communicates your message - not only for your customers, but your employees as well. Personalize your office door signs and office signage with any text or graphic at no additional charge. A clean look for any office, cubicle or interior wall with permanent custom lettering and brushed metal color choices for both the sign plate and the frame. Easy to hang, easy to wipe clean. Architectural grade metal sign holder in satin gold or a shiny, polished gold - with custom name plate insert. Our rectangular stainless steel plates with an attractive and strong Arial font and a silver black color combination to highlight the instructions that you wish to dictate. Trendy, durable, clear acrylic wall and door signs mounted with metal standoffs - customised as per your needs! A professional look to enhance any glass door or office window! Display employee names, titles, conference room names and room names with rich, frosted or colored vinyl window text. The vinyl is formatted for exterior surface or interior surface application. Two tone dimensional wooden signs, ideal for professionals and businesses looking for a unique look for their offices and corporate identity! Engrave's collection of sign boards, exterior signs, office signs, and interior signs are an effective way to communicate the essential information about facilities and services. These signs have a classy steel look with lettering that is etched and colour-filled with black paint. All Etched Stainless Steel Name Plates come with necessary screws and fittings; and can be used indoors and outdoors. Apart from an occasional wipe, no other maintenance is required. All Etched Stainless Steel Name Plates come with necessary screws and fittings; and can be used indoors and outdoors. Apart from an occasional wipe, no other maintenance is required. This is a large and eye-catching circular wooden sign that is 18 inches in diameter and 4 inches deep. It is well-designed to showcase your logo or desired graphic in a vinyl sheet and encourage folks to stop and take a second look. We think it's best suited for cafes, restaurants, and microbreweries. 3D lettering is an ideal way to draw attention to your business! The letters can be raised from the surface for extra depth and dimension, and can also be illuminated! Acrylic signs are difficult to beat when it comes to versatility! Plus... they are durable and sleek! Backlit sign boards help your business stand out, and are visible 24 hours a day! Available in a variety of materials like Acrylic, Aluminium, Stainless Steel, Metal, these signs can be customised as per your requirements! Want These Or Looking For Something Different? Tell Us... We'll Make It For You! Engrave Awards & More offers unique office wall name plates, office desk name plates, office sign boards, corporate signage and office signage for your workplace and several other unique options for mementos, keepsakes, trophies, awards, welcome kits and more. All designed exclusively to suit your brand requirements!